Advances in photographic technology in the 19th century allowed people to capture their everyday lives for the first time and also provided inspiration for artists. Rebecca Fox talks to Hocken photography curator Dr Anna Petersen about how photography impacted painter Frances Hodgkins. Visiting the home of leading Otakou family, the Karetais, on Otago Peninsula, William Hodgkins and Prof John Scott captured the lives of dairy farmers on early hand-held cameras. They photographed Mere Te Kaehe Karetai and her widowed mother, Horiwia, in their head scarves. Hocken photographic curator Dr Anna Petersen said this helped inspire Frances Hodgkins (William's daughter) to paint one of her earliest Maori-related studies in 1896. She produced a series of watercolours of young Maori girls and even wrote to her sister in Wellington asking for any photographs of Maori. The practice of drawing information and creative ideas from photographs was commonplace at the end of the 19th century, but rarely acknowledged by artists. The Karetai example showed that Frances Hodgkins was no exception. Frances Hodgkins showed an interest in painting the everyday, so the ability for hand-held cameras to capture those daily lives provided creative fodder for her. Dr Petersen said the aim of the ''Hand in Hand: Photographers and Painters Alike'' exhibition was to look at this trend in light of Frances Hodgkins' early career in Dunedin. The exhibition features some of the more notable examples of Hodgkins' figurative painting from the 1890s, drawn from collections around the country. These have been hung alongside photographs taken by her father and his friends, Prof Scott and Dr William Roberts. Many of these photographs come from the pages of a small album compiled by William Hodgkins held in the Hocken Collections. Dr Petersen believes the girl in The Girl With Flaxen Hair could be Molly Sale, the daughter of Prof George Sale, based on photographs of the young girl. She hopes the exhibition also helps to shed some light on what inspired Frances Hodgkins to pursue painting. Hodgkins' parents had mapped out a career for her in music, but she choose instead to become an artist. Dr Petersen says there is little doubt the New Zealand and South Seas Exhibition held in Dunedin in 1889-90 played a part, especially its more than 100 paintings of varying styles and subjects by British artists, such as Constable, Turner, Leighton and Millais. 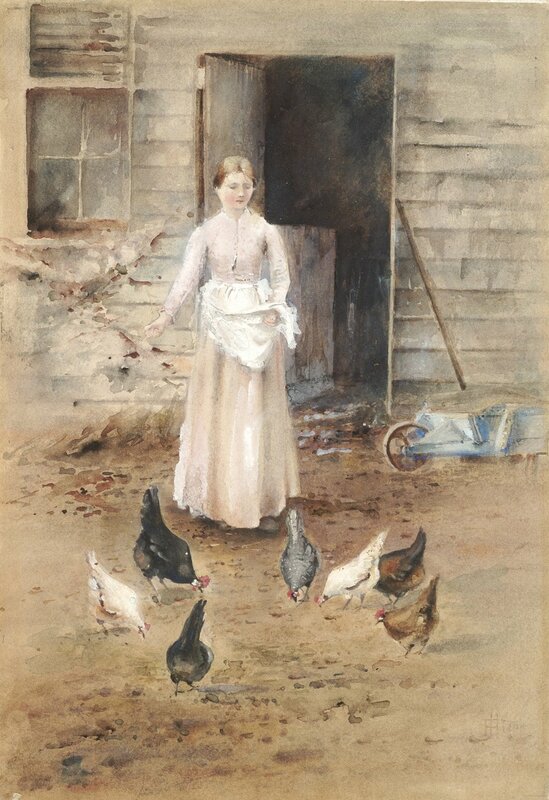 Prof Scott and William Hodgkins purchased four of the works, including Stanhopes Forbes' Preparing for the market, Quimperie Brittany, as foundation pieces for the new public art gallery in Dunedin. Up until then, Frances Hodgkins had been at odds with her father so must have felt ''greatly encouraged'' by this change in attitude. As part of the exhibition, Dr Petersen is transforming one of the gallery's annexes into a piece of the South Seas exhibition, projecting historic images of the original display on the wall. Another of the annexes is dedicated to Frances Hodgkins' work after she left Dunedin, including some photographs taken at a similar time by Dunedin professional photographers George Chance and Guy Morris, and stereographic images which are being shown for the first time thanks to the arrival of the viewing ''glasses''. ‘‘Hand in Hand: Photographers and Painters Alike’’, Hocken Gallery, Saturday until January 26. Also: Dr Anna Petersen will also be giving a public floor talk at 11am on January 12.